L. A. Noir's Denise Hamilton~Most Brilliant Woman Writer in this Genre! you can't read a better book in the noir genre! Critically acclaimed author Denise Hamilton weaves an engrossing story of teenage friendship and adult betrayal, featuring a high-powered crisis consultant who gets swept up in murder and scandal involving a wealthy political family. Maggie Silver is solidly middle class, with a mortgage to pay and an ill mother to support. She is doing her best to scramble up the ladder at an elite PR firm in Southern California whose clients include movie stars and famous athletes. Now, Maggie tackles her toughest client yet: Senator Henry Paxton, a distinguished statesman who also happens to be the father of Anabelle, Maggie’s estranged best friend from high school. When a young Chinese bride-to-be is found dead at the wheel of her Lexus at the start of this solid debut thriller, plucky Los Angeles Times reporter Eve Diamond's compulsive curiosity and professional instinct for good copy lead her into the unfamiliar and intersecting worlds of Asian gangs and Southern California's "parachute kids," wealthy Asian teens living unsupervised in San Marino mansions while their parents manage businesses on the other side of the Pacific. By quickly befriending a parachute kid "dancing with the dragon" of gang membership and just as swiftly falling in love with Mark Furukawa, a counselor for troubled teens, Eve ensures herself a role in the investigation that is both complicated and personal. Add in the murdered girl's secret diary, her shady fianc‚, a corrupt bank, a racist cop and the "jasmine trade" (smuggling girls out of Chinese provinces and forcing them into prostitution), and it's not surprising that Eve's entanglement in the case becomes life threatening. First-time novelist Hamilton, herself a former L.A. Times scribe, might be accused of "dancing with the dragon" of common mystery novel tropes, but she, unlike many of her characters, escapes essentially unscathed. In addition to a gripping story and keen observations about contemporary Los Angeles, she also offers an undeniably winning narrator: intelligent, impulsive Eve is sharp on the outside and vulnerable on the inside, willing to cogitate with equal intensity on issues private (a lost love, a dead brother) and public (racial and socioeconomic politics, "the media's scorching glare"). And Hamilton hints, ever so gently, that her heroine might return. Denise Hamilton writes crime novels and is editor of Los Angeles Noir, an anthology of new writing that spent two months on bestseller lists, won the Edgar Award for "Best Short Story" and the Southern California Independent Booksellers' award for "Best Mystery of the Year." Denise's books have been shortlisted for the Edgar, Macavity, Anthony and Willa Cather awards. 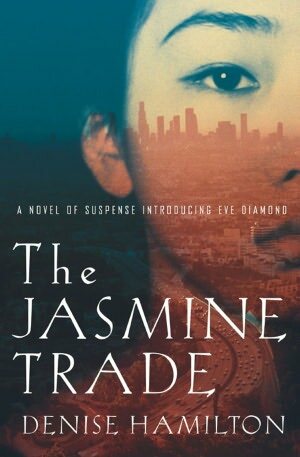 Her debut "The Jasmine Trade" was a finalist for the prestigious Creasey Dagger Award given by the UK Crime Writers Assn. Hamilton's books have been BookSense 76 picks, USA Today Summer Picks and "Best Books of the Year" by the Los Angeles Times, the South Florida Sun-Sentinel and the Toronto Globe & Mail. Denise also edited Los Angeles Noir 2: The Classics, with stories by Raymond Chandler, James M. Cain, Walter Mosley, James Ellroy, Chester Himes, Ross Macdonald, Margaret Millar and others. Denise's new novel, Damage Control, was published by Scribner on September 6, 2011 and has received raves from Kirkus (In a novel that marries celebrity culture, surf noir and the bonds of friendship, Hamilton is at the top of her game) and James Ellroy (A superb psychological thriller). She has five books in the Eve Diamond series and her standalone book "The Last Embrace," set in 1949 Hollywood, was compared to Raymond Chandler. INTERVIEW:Now, Let's Talk To Her ! Hi, Denise, you and I have talked at some length about your books and your work as a writer. I'm just going to share some of the questions you've taken the time to answer. I want to thank you for visiting my blog! 1) You chose a specific genre, a place and time to write about, what made you choose it? I write about contemporary LA because I know it. But I also wrote about 1949 Hollywood because I'm intrigued by the era and all things noir and vintage - from perfume to clothes, furniture, music and architecture. 2) Can you share how being in LA has more specifically influenced your writing? I'm an LA native, and I was a reporter for the Los Angeles Times for 10 years, which was a Passport To Adventure for exploring the city. Nonetheless, it never ceases to amaze me what I still don't know about this crazy kaleidescopic place. I love the mix of high and low cultures, the overlapping immigrant communities, the constant renewal and re-invention, the physical beauty of the snow-capped mountains, powdered sugar beaches, swaying palms and fantasy architecture. But it's also a city where the sun's hot glare casts the shadows into darker, deeper relief. It's a city of masquerade and re-invention, of ghosts and dashed hopes, where few people are what they seem. To me LA is an endlessly renewing fount of inspiration. The city herself is an important character in all my novels. And I say 'her' because LA is definitely a woman, to me she is the ultimate femme fatale, beckoning and luring you in with her seductive wiles, promising you the world's riches and fame and power and beauty and instead often leaving you sprawled behind the overflowing trash cans in a Hollywood alley at 6 am as the sun comes up, much worse for the wear and wondering how you got taken, yet again, vowing you'll never repeat this idiocy, and yet already anticipating your next encounter. 3) Which author(s) most influenced your love of books from childhood? Some of the first books and series and authors I loved were Agatha Christie, Nancy Drew, Hardy Boys, Misty of Chincoteage, Beverly Cleary, James Michener (I especially loved The Drifters), Les Miserables by Victor Hugo and Joseph Wambaugh. But I was an indiscriminate and omnivorous reader. 4) What do you make of the "Black Dahlia" murder? It's one of my obsessions in L. A. history and a mystery that's spawned so many books and a couple of movies. The Black Dahlia is part of our dark mythology in Los Angeles, our romance with the dark side. The case continues to fascinate and obsess us because of its horrifying, almost cinematic mix of elements: An extremely savage murder, a beautiful enigmatic drifting young woman, sexual perversion, hints of conspiracy and corruption in high places, landmark backdrops such as the gorgeous Art Deco Biltmore Hotel downtown. The Dahlia is a morality tale about how things can go so dreadfully wrong in Hollywood, how dreams usually don't come true, how danger and evil and corruption lurk just under the surface, how a young woman's unbridled sexuality was 'punished' by the dark forces of 1940s society, to put a feminist spin on things. She is our collective nightmare, our Hollywood cautionary tale, our worst hallucination, our Noir Angel, the flip side of Lana Turner being 'discovered at Schwabs and all the sweet young things who ever came to L.A. to make their fame and fortune. 5) How does your latest book Damage Control fit into L.A.'s noir tradition? I call Damage Control 'surf noir' because it explores the dark side of beach culture. The book opens with two teenaged girls, best friends, filled with excitement and anticipation because they're attending a summer beach party where they hope to meet some cool surfers. Instead, something awful happens down at the water line as the tide crashes and roars. From this night on, their friendship is destroyed. Fifteen years later, the girls will meet up again and have to confront what really happened on the beach that night and how it's haunted their lives ever since. We in Southern California do such a great job of exporting the myth of surf culture, the endless summer, the swaying palms and lithe tanned bodies and hedonism, but there can be a price too. Look at the Beachboys, the darkly moody lyrics of Pet Sounds just below the smooth, harmonic surface, how drugs and mental illness have ravaged the band. It's wonderful when you're 16, but when you wake up at 40, with thinning hair, incipient skin cancer and alcohol bloat, the endless summer seems more like a nightmare. 6) Were you able to keep your original titles for your books? For The Jasmine Trade and Damage Control, yes. The original title I wanted for Last Lullaby was Doll Parts, inspired by Courtney Love's song for "Hole," but my editor, perhaps wisely, told me that it might be perceived as too gory. She was probably right. (And the book isn't gory at all, I don't write serial killer stuff). I eventually came up with Last Lullaby and everybody was happy. 7) Denise, share with us a little about who you are on the personal side. What are the major distractions you may encounter on an every day basis when writing? When you aren’t writing, what are you doing?I'm reading, taking care of kids and sampling, sniffing and writing about perfume. (I'm also the perfume columnist for the Los Angeles Times). I have two kids and my writing day is bookmarked by when they leave for school and when they return. From 3-9 pm I take off the writing hat and put on the Mommy hat. So I have to write fast and on a kind of 'deadline.' Sometimes if I'm in the middle of a scene when they return, I'll try to jot down the skeleton and fill it in the next day. I'm very lucky that I worked as a journo for 10 years. It taught me how to write fast, meet deadlines, tune out distractions and revise and edit constantly. These are all helpful tools for a novelist. 8) I read, actually, devoured your "Los Angeles Noir" short stories! This is a fantastic book. What drew you to edit the collection called "Los Angeles Noir" and how did you make it relevant for 21st century Los Angeles? I had to think long and hard about what noir is for me, whether the city still pulses with the Chandlerian tradition or whether it's all pastiche and homage now. Roaming L.A. as a reporter for 10 years also helped give me insight into the city's dark places. I came to the conclusion that Los Angeles today is more noir than it's ever been but perhaps it's just more hidden today, or it's taking place within subcultures, or behind gated communities, or among the city's many ethnic communities, or in the antiseptic high-rises of downtown in corporate boardrooms. You can't write about the solitary white guy detective with a trenchcoat and a fedora with an office on Hollywood Boulevard and a bottle in the bottom drawer of his desk and a gun in the top drawer. Chandler did it too well 60 years ago. So maybe today the femme fatale is Chinese-American, and the gangsters are Russian Mafiya instead of Mickey Cohen's crowd. Or the denouement takes place in a Koreatown day spa. And the body gets dumped in the concrete banks of the L.A. River instead of the orange groves of Pasadena or the bean fields of Mar Vista - which are no more. But noir is eternal because it's about the 10 Commandments and the Seven Deadly Sins (or at least some of them) and human nature is the same as it ever was. So for me, editing L.A. Noir was about bringing in writers of color, women who wrote pulp, who lived in a 'got' LA, and putting together a crime fiction collection that showed the city's ethnic and racial diversity, and not just the usual suspects and stereotypes, however beloved they are. One of my favorite noir movies ever is Blade Runner, and that's set in a sci-fi future. Tell me that Harrison Ford the 'blade runner' isn't a Philip Marlowe archetype, or that Sean Young isn't a futuristic femme fatale. All the tropes are there, and yet they've morphed and shape-shifted in a way that makes them utterly original and fresh again. That's what I was trying to capture in LA Noir and also in my own writing, starting with The Jasmine Trade, my first novel, which is set in L.A.'s immigrant Chinese community. Noir is an eternally revitalizing force in literature that adapts to all times and places because it's about the frailties of human nature. And that's why I love it. I cannot say enough about the writing style of Denise Hamilton. She not only knows the streets of LA, she breathes life into them through her every written word. It's chilling to read her books. Denise has the skill of a fine surgeon, knowing just when and where to place the razor and how to cut to release that last shred of skin between our belief and disbelief. Her hand is quick and so adept we hardly know we've been "had" until it's over and we're shocked to see our heart in our hands. She is a master writer of this genre. I have a feeling Denise is a masterful writer of anything she chooses to put her mind to. I thinks she's spoiled me for reading anyone else in noir fiction, female or male. "The Jasmine Trade" is breathtaking. I was completely spellbound by the insider information and story surrounding a young girl killed outside a shop with her bridal dresses in her car! What starts out as a horrendous, but not that unusual these days, tale of a young girl's tragic murder, turned into a spider web of the macabre for me. Denise Hamilton unveiled layer after layer of LA's underside, teaching me things I had no idea existed; i.e., "parachute kids?" I'd never even heard this was happening in our country. And she shone a light into some dark dwellings both physical and psychological that left me shuttering. What I found most exciting about Ms Hamilton's writing in both the novels I read (and her short story "Midnight In Silicon Alley" in her L. A. Noir Collection) was her ability to use an ordinary pace, an simple staccato of words and sentences to lay out the most astounding and dark situations. A clip of interchange between characters that conveyed more than just the words themselves...It was like reading the movements of a cat studying it's prey before pouncing! Glorious and so unusual I wanted to clap and yell, "Yes!!" several times through the books. This kind of writing is intense and so freaking rare! Let me say a little bit about Eve Diamond, who is the journalist/investigative writer protagonist of "The Jasmine Trade." She is vulnerable, hard-core on the side of right, and devoted to her story. I'm a huge fan of this character. I loved everything about her. Hamilton hits just the right chords with her balance between a woman with the insecurities of a feminine sort, and a journalist looking for more than just the surface report in order to lift the scab off a deeper slash on the LA landscape. It's Denise's development of both these sides of her that makes Eve a remarkable character, but it's the use of Eve's vulnerabilities that makes the story itself just blast off the pages. She is unrelenting when looking for the truth behind a murder; but, bound up and driving that is the underlying concern for Asian children abandoned by their parents, for instance. Eve Diamond is a character I can happily read more about in Hamilton's other novels. What was new to me about these books among all the books I've read? The dark tone of "voice." The descriptions of the underbelly of the city and the surrounding scruff and side-beaches. The brilliance of too much light at night and used tinsel garishness by day, both literally and figuratively. The "invisible" people that stray and strand along the sidelines of the glitz and glamour of Hollywood and LA. Concepts of evil hidden behind the flat, compliant faces of ordinary kids in designer label outfits- -apparently, no drugs applied. How swiftly calm, security and routine can be smashed in a smoky room, in an unknown section of town where you weren't aware that nobody speaks English, and you don't know how to get a ride home. The multi-cultural nature of a city that is a microcosom of our country and where we're headed. I've tried to convey to you how unusual and how brilliant a writer Denise Hamilton really is. "Damage Control" will send ice splints through your veins. "The Jasmine Trade" will change the way you look at Asian children and their parents for a while; at least it changed things for me. I haven't been able to put these books, and Ms Hamilton's short story out of my mind. I keep returning to parts of them long after I've read them. When studying fine arts and art history I learned that one of the tests of a masterpiece is that we can't stop looking at it. We find ourselves continually drawn back into the painting, finding more things of interest and wanting to look at it longer. There is much of this quality in Denise Hamilton's books. They just keep coming back to haunt you. 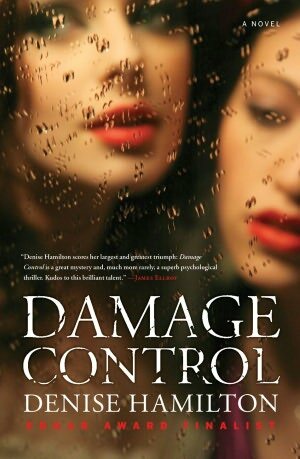 READ EXCERPTs of "DAMAGE CONTROL" and others of her books on her WEBSITE! !